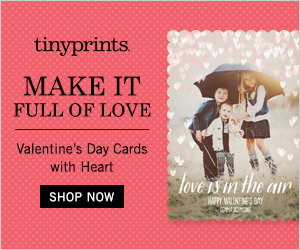 Shutterfly: One Free Card. One free 5x7 flat, 5x7 folded, or 5x5 flat card on signature cardstock. Shutterfly: New Customer Offer. 50 free 4x6 prints. Offer expires one calendar month from the date that customer signs up for their Shutterfly account. Offer is good for 50 free 4x6 prints through shutterfly.com, Shutterfly iPhone, iPad or Android apps. Valid only for new Shutterfly customers (those who have never purchased from Shutterfly). Offer cannot be redeemed more than once per account and/or billing address. This particular offer code can only be redeemed once. Taxes, shipping and handling will apply. Not valid on other sizes, prepaid plans, other products, prior purchases, orders placed for in-store pick up or purchases made through Shutterfly Pro Galleries. Valid for the intended recipient only. Cannot be redeemed for cash or combined with other offers or credits. Not valid for resale. Tiny Prints Want to make your cards even more memorable? Then be sure to take a look at some of our card ideas to get inspired. We also have a great selection of gift ideas such as iPhone cases for every occasion. See our gifts for men, anniversary gifts, personalized gifts, gifts for mom, Christmas gifts, gifts for her, graduation gifts and wedding gifts.